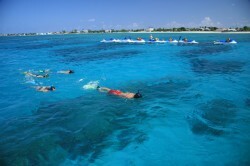 Grand Cayman’s calm clear waters, white sand beaches and accessible shallow reefs make the island a snorkeler’s paradise. For adventurous snorkelers who want to explore sites from personal watercrafts, Red Sail Sports offers daily Waverunner Safaris from all locations on Seven Mile Beach and Rum Point. Sign up for a Safari and enjoy a thrilling Waverunner ride, skimming across the water, from snorkel site to snorkel site. Small groups of up to 5 waverunners can participate in the Safari, so be sure to book your spot in advance (24 hrs notice) for a guided tour that lasts up to an hour and a half and includes two snorkel stops.